The aim of this study was to investigate the probable toxicity on brine shrimp, phytotoxicity, and insecticidal activity of Chrysophthalmum gueneri Aytac & Anderb. The MeOH (80%) extract obtained from the whole plant of C. gueneri was fractionated through subsequent solvent extractions in increasing polarity with n-hexane, chloroform, and n-butanol. The MeOH (80%) extract and all fractions of C. gueneri were evaluated for their biologic activities using in vitro screening bioassays such as brine shrimp lethality test and phytotoxicity against Lemna minor, as well as insecticidal activity against Rhyzopertha dominica and Tribolium castaneum. The findings showed that the n-hexane and chloroform fractions of the plant had significant phytotoxic activities with 100% growth inhibition (GI) at 1000 μg/mL against L. minor. Moreover, the MeOH (80%) extract (53% GI) and n-butanol fraction (46.6% GI) of the plant had moderate phytotoxic activities at 1000 μg/mL. Otherwise, no samples had toxicity on the brine shrimps. In addition, the remaining water fraction had low insecticidal activity with 20% mortality against T. castaneum. Our results show that the n-hexane and chloroform fractions of C. gueneri had potential phytotoxic effects. The genus Chrysophthalmum Schultz Bip., which belongs to the family Asteraceae, tribe Inulaeae, is represented by four species around the world.5 In Turkey, the genus Chrysophthalmum has three species, namely Chrysophthalmum montanum (DC.) Boiss., Chrysophthalmum dichotomum Boiss. & Heldr. and Chrysophthalmum gueneri Aytac & Anderb. growing in Turkey.6 Among them, C. gueneri is an endemic herbaceous plant with linear-lanceolate leaves and slender peduncles that grows around Cirlasun bridge, Alanya, Turkey.7 To date, no phytochemical data has been reported on C. gueneri. In our ongoing investigations on the genus Chrysophthalmum, the cytotoxic activity of C. gueneri was tested for the first time against some cancer cell lines using a sulforhodamine B assay.8 In our previous studies on preliminary screening bioassays such as toxic effect on brine shrimp, phytotoxic and insecticidal activities, the n-hexane and chloroform fractions of two species, C. montanum and C. dichotomum, were found as promising plant sources due to having phytotoxicity and toxicity on brine shrimps.9,10 Following our studies on C. gueneri, we now aimed to evaluate in vitro phytotoxicity and toxicity on brine shrimps and the insecticidal effect of the plant. The whole plants of C. gueneri Aytac & Anderb. were collected from wet places among pine forest around Cirlasun bridge, Antalya, Turkey, at the flowering stage in August 2014. The plant was identified by one of our authors Barış Bani PhD, (Kastamonu University). Voucher specimen (F.A. 46) was deposited at the Herbarium of Gazi University (GAZİ), Ankara, Turkey. The air-dried whole plants of C. gueneri (780 g) were extracted four times (4x4000 mL) with 80% methanol at 25°C by stirring for 2 days. After filtration, the combined methanol extracts were evaporated in vacuo at 40°C to dryness. The concentrated MeOH extract (140.0 g, CG) were further fractionated by successive solvent extractions with n-hexane (15x250 mL), chloroform (10x250 mL), and n-butanol saturated with H2O (9x250 mL) in a separator funnel. Each extract and remaining water phase (R-H2O) were evaporated to dryness under reduced pressure to yield “n-hexane fraction” (5.6 g, CGH), “CHCl3 fraction” (13.6 g, CGC), “n-BuOH fraction” (25.4 g, CGB) and “R-H2O fraction” (67.0 g, CGR), respectively. According to the criteria, the GR (%) means low activity in 0-39%, moderate activity in 40-59%, good activity in 60-69%, and significant activity in >70%. The methanol (80%) extract and subsequent solvent fractions of C. gueneri were tested against Rhyzopertha dominica and Tribolium castaneum using the impregnated filter paper method.14 To prepare the stock solution, the samples (200 mg) were dissolved in 3 mL of methanol. The samples were applied to filter paper (1019.10 µg/cm2) of appropriate size (9 cm or 90 mm) on Petri dishes using micropipette. The plates were left for 24 h to evaporate the solvent. The next day, 10 insects of each species were placed in each plate (test and control) using a clean brush. Permethrin (239.5 µg/cm2) was used as a positive control; methanol was used as a negative control. The plates were incubated at 27°C for 24 h with 50% relative humidity in the growth chamber. Ethics committee approval was not necessary for this study. In this study, we examined the methanol (80%) extract and the fractions of C. gueneri for their lethality, phytotoxicity, and insecticidal activity with primary screening bioassays. The brine shrimp lethality test on C. gueneri was investigated at concentrations of 10, 100 and 1000 µg/mL, using etoposide as a standard drug. All fractions and the methanol extract had no toxicity against the brine shrimps (Table 1). The phytotoxicity assay is a useful primary screen for weedicide research. It is also observed that natural antitumor compounds can inhibit Lemna growth.13 C. gueneri showed variable effects in terms of phytotoxicity against L. minor. It was found that the tested samples had dose dependent activity. The n-hexane and chloroform fractions of the plant showed significant phytotoxic activities with 100% growth inhibition (GI) at 1000 µg/mL. Moreover, the MeOH extract and n-butanol fraction had moderate phytotoxic activities with 53% and 46.6% of GI at 1000 µg/mL, respectively. In addition, low phytotoxicity was found in the remaining water fraction with 31.2% of GI at 1000 µg/mL, followed by the chloroform (21% GI), n-hexane (15.4% GI), n-butanol (13.3% GI), and methanol (80%) extract (6.2% GI) of the plant at 100 µg/mL. There was no phytotoxicity in any tested samples at 10 µg/mL (Table 2). 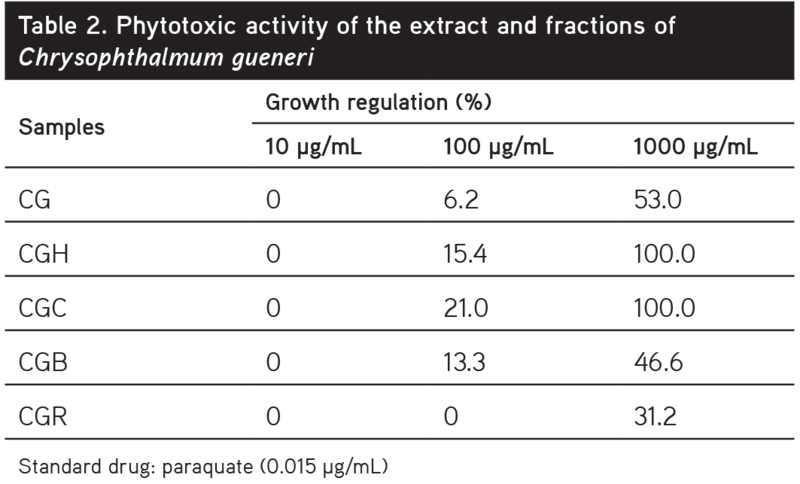 The methanol extract and fractions of C. gueneri were also screened for their insecticidal effects against R. dominica and T. castaneum using permethrin as a standard drug. 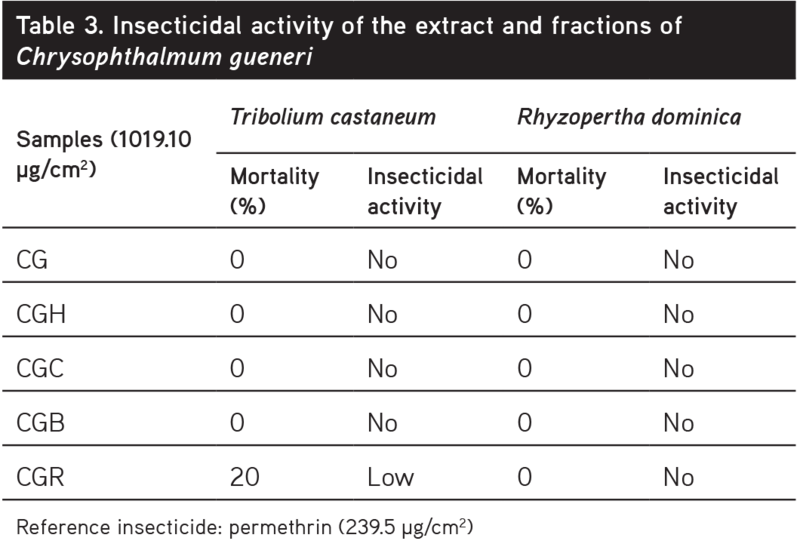 The remaining water fraction had low insecticidal activity with 20% of mortality against T. castaneum (Table 3). The present paper is the first to present data to show that C. gueneri exhibits a variety of phytotoxic and insecticidal biologic activities. According to our results, the n-hexane and chloroform fractions of the plant were found as promising samples because they had significant phytoxicity on L. minor. In our recent study, n-hexane and chloroform fractions of the plant also exhibited cytotoxicity on selected cancer cell lines.8 Our results also showed that the n-hexane and chloroform fractions of C. gueneri contained bioactive constituents and these fractions could lead to the discovery of important agents. In conclusion, according to conventional herbicides and pesticides, C. gueneri could be considered a potential source for developing natural constituents possessing weedicide and insecticide activities with less risk to human health and the environment. Therefore, further investigations are merited in order to identify the responsible bioactive compound(s) in C. gueneri. 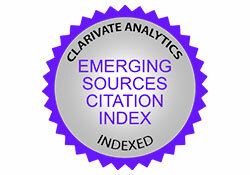 This study was supported by TÜBİTAK-2211/A and ICCBS-HEJ. Inayatullah S, Irum R, Rehman AU, Chaudhary MF, Mirza B. Biological evaluation of some selected plant species of Pakistan. Pharm Biol. 2007;45:397-403. Ullah R, Ibrar M, Shah S, Hameed I. Phytotoxic, cytotoxic and insecticidal activities of Calendula arvensis L. J Biotechnol Pharm Res. 2012;3:104-111. Khuda F, Iqbal Z, Zakiullah, Khan A, Nasir F, Muhammad N, Khan JA, Khan MS. Metal analysis, phytotoxic, insecticidal and cytotoxic activities of selected medicinal plants of Khyber Pakhtunkhwa. Pak J Pharm Sci. 2012;25:51-58. Uddin G, Rehman, TU, Arfan M, Liaqat W, Mohammad G, Choudhary MI, Phytochemical analysis, antifungal and phytotoxic activity of seeds of medicinal plant Indigofera heterantha Wall. Middle-East J Sci Res. 2011;8:603-605. Rechinger KH. Chrysophthalmum Schultz-Bip. In Kotschy. In: Rechinger, KH, ed. Flora Iranica 145. Compositae IV-Inuleae. Graz; Akademische Druck und Verlagsanstalt; 1980:131-132. Grierson AJC. Chrysophthalmum Schultz Bip. In: Davis, PH, ed. Flora of Turkey and the East Aegean Islands. Edinburgh; Edinburgh University Press; 1975;5:52-53. Aytac Z, Anderberg AA. A new species of Chrysophthalmum Schultz Bip. (Asteraceae-Inuleae) from Turkey. Bot J Linn Soc. 2001;137:211-214. Ayaz F, Kucukboyaci N, Sarimahmut M, Bani B, Duman H, Ulukaya E, Calis I. Cytotoxic activity of the Genus Chrysophthalmum Schultz Bip. from Turkey against various human cancer cell lines. 3rd EACR-Sponsored Anticancer Agent Development Congress; İzmir, Turkey; 2015:42. Ayaz F, Küçükboyacı N, Duman H, Şener B, Choudhary MI. Cytotoxic, Phytotoxic and Insecticidal Activities of Chrysophthalmum montanum (DC.) Boiss. 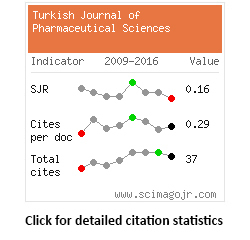 Turk J Pharm Sci. 2017;14:290-293. Ayaz F, Küçükboyacı N, Bani B, Şener B, Choudhary MI. 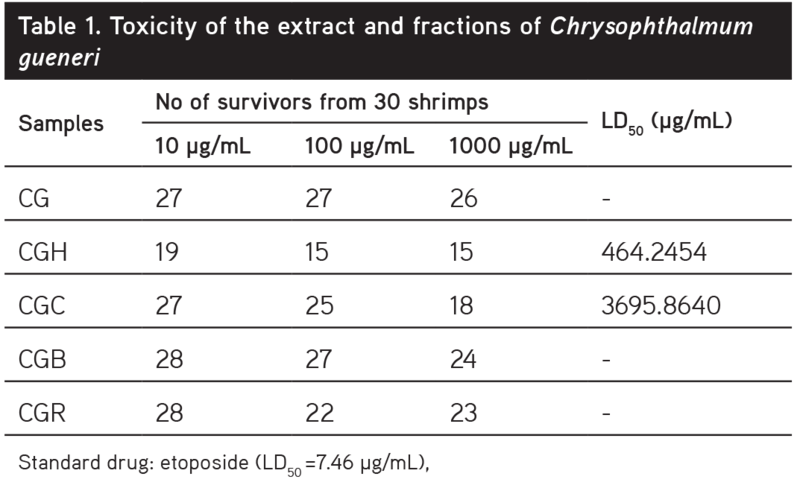 Phytotoxic, cytotoxic and insecticidal activities of Chrysophthalmum dichotomum Boiss. and Heldr. Indian J Pharm Educ. 2018;52:467-471. Finny DJ. Probit Analysis. (3rd ed). Cambridge; Cambridge University Press; 1971:333. Meyer BN, Ferrigni NR, Putnam JE, Jacobsen LB, Nicholas DE, McLaughin JL. Brine Shrimp: A convenient general bioassay for active plant constituents. Planta Med. 1982;45:31-34. Rahman AU. Studies in Natural Product Chemistry. The Netherlands; Elsevier Science Publishers BV; 1991;9:383-409. Rahman AU, Choudhary MI, William JT. Bioassay techniques for drug development. The Netherlands; Harward Academic Publisher; 2001:67-68.